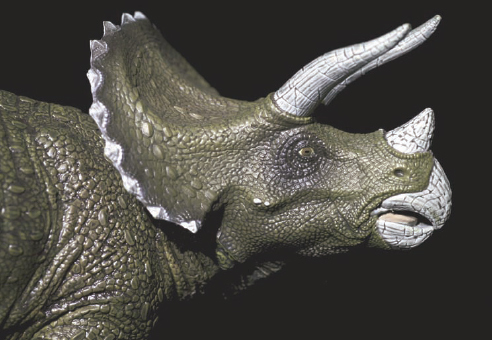 What were the ceratopsians like? The ceratopsians (“horny faces”) appeared in the Early Cretaceous; by the Late Cretaceous, about 100 million years ago, the animals began to diversify in North America and Asia. They were the biggest of all the dinosaur families and lasted a total of about 35 million years. There were frill-and hornless ceratopsians, including the Protoceratops from Mongolia, and the unusual, bipedal Psittacosaurus. The huge, horned, frilled ceratopsians were found only in the Late Cretaceous period of North America—and were some of the last known dinosaurs to have roamed the planet. Some ceratopsians were bipedal; some were quadrupeds. It is thought that the quadrupedal ceratopsians evolved from bipedal dinosaurs, as their front legs are shorter than their rear legs. They evolved very strong front legs that were powerful enough to hold up their massive heads, and they ranged from turkey-to elephant-sized animals. The ceratopsians probably traveled in herds. One reason for this suggestion is that huge fossil remains from hundreds of individual, same-species ceratopsians have been discovered in the western United States in so-called “bone beds.” Such a large number of the animals in one place suggests that the dinosaurs were traveling together when a tragedy hit, killing them all. Traveling in such large groups, the larger animals, with their intimidating, huge horns and frills, could circle and protect the weaker and younger ceratopsians. Other times, the group could stampede to escape or attack predators. The Triceratops—named after the three horns on its face—was a ceratopsian, a kind of dinosaur distinguished by its prominent head frill (iStock).